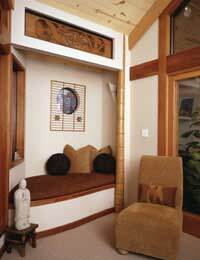 Why Create a Home Sanctuary? Home > Create a Home Sanctuary > Why Create a Home Sanctuary? In an age of advanced technology and labour saving devices, we are all working more and taking less time off. According to Rubin R. Naiman, author of Healing Night, during the last thirty years, people also have been working longer hours and more days per week, increasing their time at work by one full month or 150 extra hours a year. Work and family responsibilities keep us on the go and very stressed. We all need a special place that we can call our own to help us cope with this lifestyle and the stress it produces. Our homes are the natural venues for these special sanctuaries. A sanctuary is a place of refuge and safety. It is a place where you come to feel inspired and renewed. We all need a place we can escape to where we can rest, feel pampered, and recharge our spiritual batteries. This is especially important for women. Though women may keep a household running and everybody else's spaces clean and functioning, they don't always have a place of their own. If your home is small or there are many living in your household, the need for your special space is even more crucial. You need a place where you can relax, meditate, exercise, create, and pamper yourself. Though some of these activities can be done in group living spaces like a family room, living room, or a furnished basement, you will most likely be in a space where others are already present or where there is the potential for others to intrude on your activities. Some activities like meditation need solitude and cannot be done in when others can interrupt you. A home sanctuary is not a luxury. It is a critical part of coping with stress and meeting our basic needs and our being needs. That includes our biological needs, safety needs, aesthetic needs, cognitive needs, and transcendence needs. We need to be able to come home to a restful, safe place where we can disconnect from the stresses of the day. We need to be able to close our doors (and lock them if we need to) and breathe a relaxing sigh. Feeling safe and comfortable in our homes or just one special room can help us cope. We also need to think well of ourselves and feel capable and belong. Activities that we do in our home sanctuary spaces can build our self-esteem. Here, we can reflect on our successes and develop new skills. Having a special sanctuary space can help us feel that we are valued and belong. We honor ourselves by creating a special place where we can engage in those activities that will help us create and know ourselves better. When others in the household respect our special place and our right to have it, we feel that we belong. If we can share our interests with others in our special place, that expands our sense of belonging. Grooming routines combine both biological and aesthetic needs. Bathrooms and vanity areas are places where we take time to look good and feel even better. Having a place where we can pamper ourselves and explore new grooming tools (nail polish, new scented soaps, etc.) can help us relax and tap into playfulness. Aesthetic needs can also be met by finding something beautiful to look at. Often this is art, photographs, sculpture, flowers, or plants. Having a special place to look at beauty is important in reducing our stress and helping us to grow as human beings. A home sanctuary can also be a place where we can continue to learn without the pressures of jobs or school. We can read or study for pleasure or to find meaning or solve problems. Therefore, having a special place is important for meeting our cognitive needs. Finally, a home sanctuary provides a place for us to meditate, create, and experience spiritual or peak experiences that give our lives added meaning. We can do this because we feel safe and protected and can then explore this inner, spiritual territory. Creating a home sanctuary, therefore, is not a luxury but a way we can meet our basic needs and our being needs. We can use the insights we gain doing activities in our home sanctuary space that can help us grow as human beings. We also may learn skills to cope with the frenetic pace of our lives. We all need a special place where we can just relax and allow our bodies, minds, and spirits flourish.